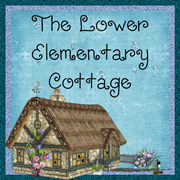 The Lower Elementary Cottage: Sub Tub Linky with Freebie Friday! 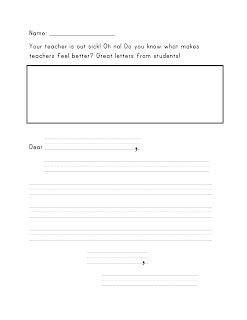 NOTE: I realized Google Docs doesn't recognize my special primary writing lines font so you can find this printable as a freebie in my TPT store now. 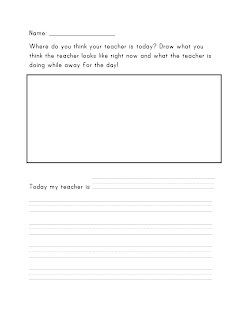 Just click here for Prompt 1 and Prompt 2 to get the original PDF I created. I am one of those teachers who never takes a day off unless I feel like I'm dying. Somehow cleaning up the disaster left behind is far worse than just showing up a finding ways to keep the kids quietly busy. Besides, our school has a policy that we have to individually call every sub until we find one that will cover our class, no sub line (I REALLY miss the sub line at my old school!!!). This in itself is torture. If I feel crummy the last thing I want to do is call strangers at 6:00 am and beg them to watch my class. I was in tears once and gave up. I called my principal and said, I can't find a sub, but I can't drive so I'll see you tomorrow. I've emailed sub plans to you. Anyway... it happens... we all need subs, which means we all need Sub Plans! So do you know what that means?! An excuse for Linky Party!! One of my favorite things to leave is coloring math! I know this isn't a freebie, but it's by far the biggest success every time! You can find them on Scholastic Teacher Express sales for only $1!! Totally worth every penny! I get the emails and stock up a couple times a year on the eBooks. 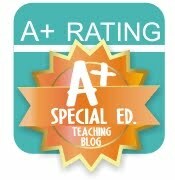 I also love to use the Read and Understand series from Evan-Moor. These books have a great set of stories with comprehension pages and other activities that link to common core such as syllables, phonemic awareness, phonics, sequencing, etc. A kindergarten one is shown here, but if you click the picture it will take you to the full list of the series. They've been moving toward eBooks, so you can often get the paperback ones for really cheap as they discontinue printing them. Another great thing is a good writing topic! I love coming in to a pile of "get well" letters, and cards that say "we missed you!" So I've created a couple little writing prompt pages. You can get them here! Just click on the images to get the one you want. One is a creative writing about where the kids think you are and what you look like. Oh the pictures you get with these!! I once had a student draw me in a hospital bed :) The other one is a letter format with a little bit of space for an illustration. Great ideas! I love those "Read and Understand" books. Thanks for linking up to my "Sub Tub Linky party! I love the writing pages for my Sub Tub! Thank you so much let me know if you have anything else for a great sub tub.